As a young girl, I remember performing with my dance troupe beneath the pagoda in Chinatown Square for Chinese New Year, fluttering silk ribbons and pirouetting with long silk fans in mid-air. One of my fondest memories, though, is receiving red envelopes stuffed with lucky money – what kid wouldn’t love that? 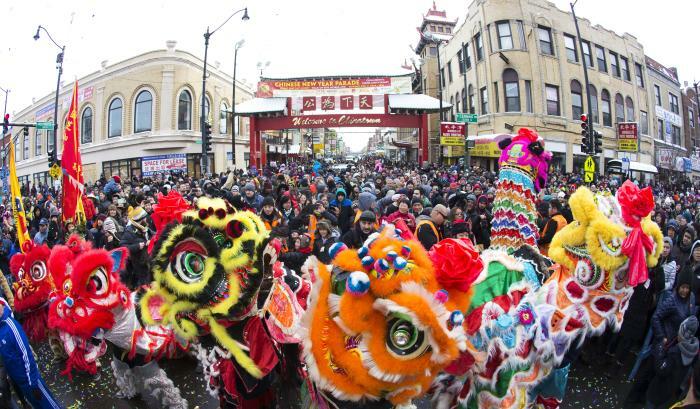 Each year, Chicago’s citywide Chinese New Year Celebration inspires me to relive those incredible childhood memories—and offers a score of Chicagoans and visitors the opportunity to create their very own. Among the vibrant annual Chinese New Year celebrations are traditional lion and dragon dances, martial arts performances, film screenings, dumpling-making workshops, special dinners, and more. For those of you unfamiliar with Chinese New Year, it begins on Friday, February 16, heralding in the Year of the Dog, one of 12 animals in the Chinese zodiac. Traditionally, the New Year is the most important and longest public holiday in China, beginning on the 23rd day of the 12th lunar month, and ending on the 15th day of the first lunar month the next year. It&apos;s a time to be spent with friends and family, feasting and looking forward to a prosperous year ahead. From a cultural perspective, Chicago&apos;s relationship with China is growing only more significant. And, in fact, Shanghai and Shengyang have been sister cities to Chicago since 1985. Locally, Chicago&apos;s Chinese population is thriving, with much of the growth concentrated in a robust Chinatown (one of the largest Chinatowns in North America), where new immigrants feel right at home in a bilingual enclave. Take the CTA Red Line to the Cermak-Chinatown station to explore for yourself. Lion statues guarding the escalator as you arrive welcome you while warding off evil spirits. This year is significant in part because of two premier events among the many citywide happenings. This event places the Chongqing Chuanju Opera Theatre center stage to present the dazzling costumes and acrobatic choreography of traditional Chinese opera. Selections such as The Taming of the Gambler and Jin Shan Temple will be performed. Zhejiang Symphony Orchestra further showcases traditional Chinese instruments in colorful orchestral arrangements of Chinese folk melodies and favorites from China’s Zhejiang Province. Featuring Chinese bronzes of the second and first millennia BC, the objects exhibited here are some of the most distinctive achievements in the history of art, created through a unique method of clay models and piece molds. These exquisitely ornamented vessels were made to offer sacrifices to ancestors, to accompany the deceased to the underworld, or to commemorate familial lineages in public ceremonies. When emperors uncovered them centuries later, these spiritually significant objects acquired yet another layer of meaning as integral parts of imperial collections. This exhibition is the first to explore in depth the tradition of collecting ancient bronzes in China, and to showcase how they were collected, classified, and conceptualized throughout history. Chinese New Year culinary-themed festivities also are scheduled throughout the city. The Peninsula Chicago (108 E Superior St.), for example, will dress for the occasion with red lanterns (red is a lucky color in Chinese culture) and tangerine trees, celebrating with an auspicious lion dance on the afternoon of Saturday, February 17, and serving a special Chinese New Year afternoon tea in the refurbished Lobby restaurant from February 15 through 18 (price $65 per person). Also at Peninsula Chicago, Shanghai Terrace will present an indulgent eight-course menu of Chinese classic dishes from February 15 through 20, including double-boiled ginseng soup, XO fish fillet and Australian red abalone ($138 per person). And remember that dumpling-making workshop I mentioned? Hing Kee Restaurant, (2140 South Archer Ave.) will be hosting a 2018 Chinese New Year Dumpling Making Dinner on Saturday, February 10, 17 and 24 at 3:30 pm ($40 per person). Chinatown is brimming with delicious, indulgent foods year-round. Fooditor 99, Chicago&apos;s insider food guide, recommends Dolo (2222 S Archer Ave.) for dim sum, A Place by Damao (2621 S Halsted St.) for authentic Chengdu street food, and Slurp Slurp Noodles (2247 S Wentworth Ave.) for hand-cut noodles in soup and stir-fries. In recent years, new restaurants like Imperial Lamian (6 W Hubbard St.) in River North have begun to offer tasty contemporary twists on Chinese flavors, too. Truthfully, there are so many events to choose from this year. Take a look at what’s happening, and definitely start your planning early. Preston Bradley Hall, 78 E Washington St. Exclusive Lunar New Year Red Envelopes will be available at the Concierge Services on Level 1 near Saks Fifth Avenue OFF 5TH. Amber is a Northwestern graduate and freelance journalist specializing in travel, food and wine. Her work appears in Forbes, Saveur, Departures, Hemispheres, American Way, WestJet Magazine, Four Seasons Magazine, National Geographic Traveler and Private Air Luxury Homes. Follow her adventures in Chicago and around the world on Instagram and Twitter.